We interrupt this blog with a weather warning. 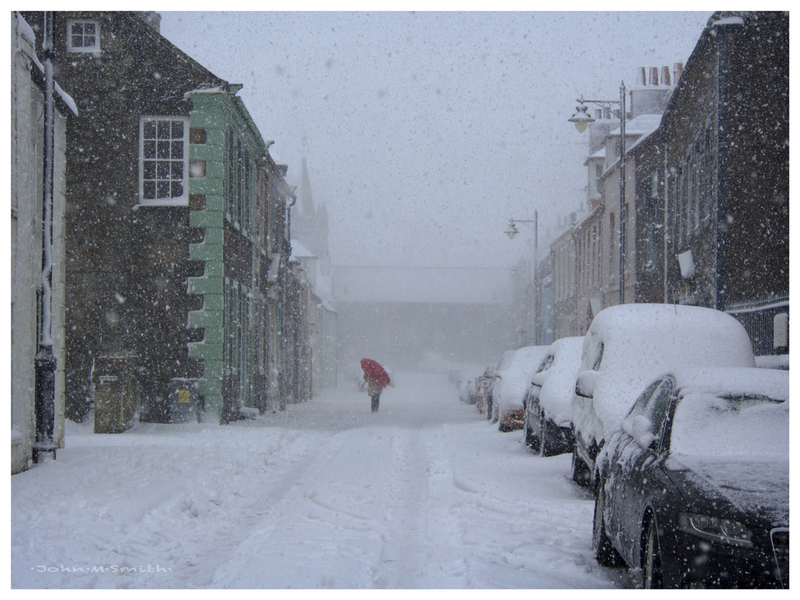 Heavy snow falling in South West Scotland. You are advised to stay indoors and keep blogging. These scenes were taken yesterday…..an early Springtime weather phenomenon …….. it snowed for over 20 hours, these are mid afternoon views…… and up to now we’ve had between 30 and 40 cm of snow, that’s over a foot. As we live on the coast, heavy snow is quite uncommon. The top photo was taken at the cross roads in the centre of town, looking down towards McClellands’ Castle. 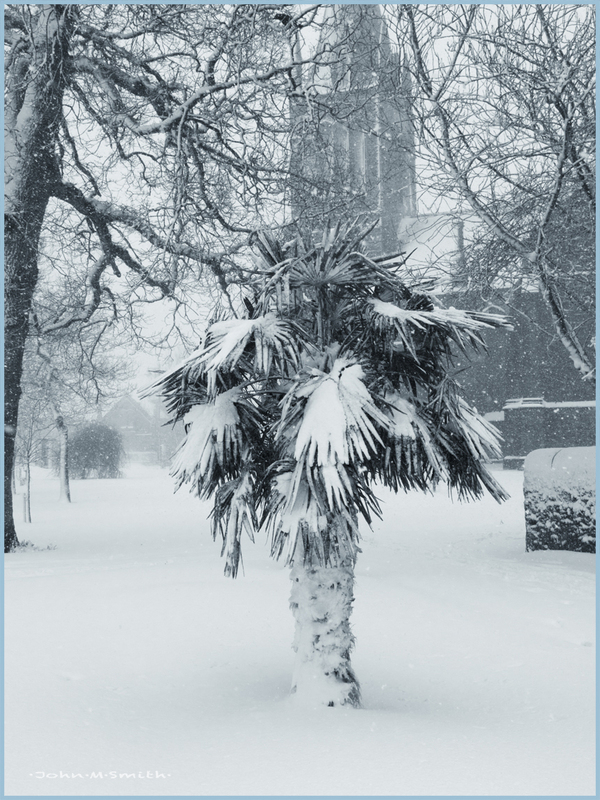 The next view is of the palm tree in the Sopiary Gardens with the Parish Church in the background. The final scene was taken looking down the old High Street towards the Tolbooth. Kirkcudbright, Dumfries & Galloway, Scotland,. 22 March 2013. We are getting snow too down here in Cambridge!! Bizarre weather really..
You too John.. No let up here so far! Love that red umbrella! How perfect against all that white snow! Yes, Laurie, good fortune strikes again. Just back from Fuerteventura and this weather is a bit of a shock to the system. No snow here in Somerset though, just cold. I also love the red brolly. Thanks Mr B. same here, just back from India, but heading south soon. Great images John, especially the red umbrella. Still snowing here too. Nice photographs and I see you captured my favorite color “red” . I like that accent of the green building against the snow. Hope it ends soon and you get nice sunny weather. Thanks Mary, I wasn’t sure about leaving the green, but the red was sent from heaven, and while snow is exciting for a few days, we all are looking forward to warmer weather. Great shots! The red umbrella is a lovely touch. I also like the strong structural elements of the second photograph and the toning works well. 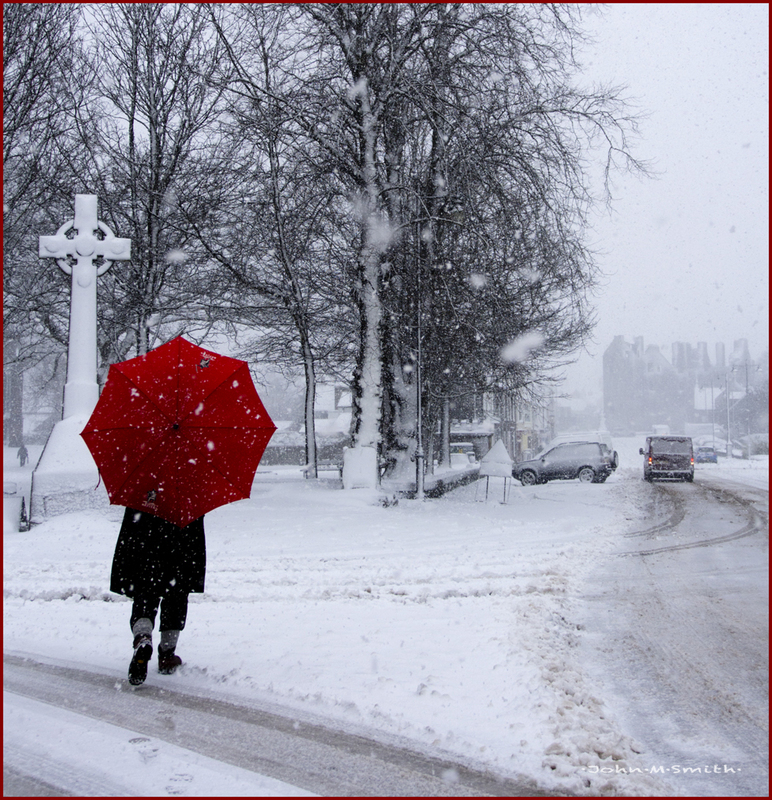 Much appreciated, Noeline……and the two red umbrellas were different people….how lucky is that! 🙂 ….. and I thought you had a helper. As you say, how lucky is that?! Did the palm tree get lost…blown over the ocean on a storm wind…and it survives there? Love the falling snow, John…. An interesting comment, Scott. Being a maritime climate, warmed by the Gulf Stream, there are a number of open gardens with sub tropical species, though they have taken a hammering over the last three winters. The tree in our neighbours garden succumbed last year and we have lost all our cordelynes and yukkas…. Guess I’m not so familiar with your weather patterns over there, John…would have expected that nothing so tropical as a palm tree would survive there…nor the yucca plants…seems that those creatures need a desert climate to thrive….